PRE-ORDER 1-2 Week Shipping Delay. 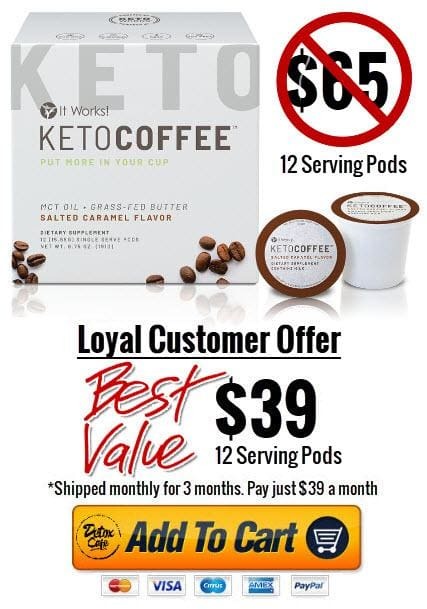 It Works Keto Coffee Pods Loyal Customer Special! It Works! 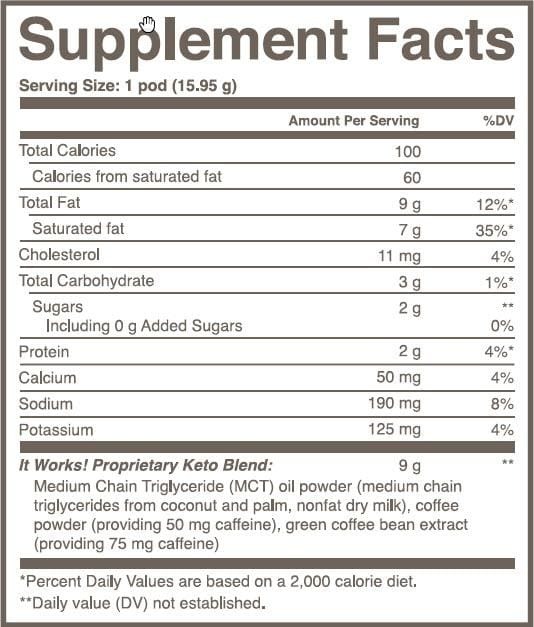 Keto Coffee is an instant coffee with Grass- Fed Butter and Medium Chain Triglycerides (MCTs) to help increase your body’s ketone production and the process of ketosis.† It comes in both single-serving packets and salted caramel flavored coffee pods. Why should I drink/use It Works! Keto Coffee? How do I prepare It Works! Keto Coffee? What flavor is It Works! Keto Coffee? Life is too short for bad coffee and there are two delicious keto coffee options (both with the same great keto benefits) to keep you deliciously caffeinated. The It Works! Keto Coffee packets come in a smooth, buttery-rich flavor and the salted caramel It Works! Keto Coffee pods are the perfect combination of sweet and salty for when you fancy a treat. Suggested us for It Works Keto Coffee PODS. For the perfect cup of coffee, load 1 pod into a single-serve brewing system and brew with 8. oz. of water. Do not remove foil seal as pod will not work properly in the brewer. It Works! Keto Coffee™ can be enjoyed hot or cold any time you need extra focus, a boost of energy, or to fight hunger!† Drink It Works! Keto Coffee™ first thing in the morning or anytime you’d reach for a cup of coffee for a quick pick-me-up that helps curb cravings.† As both It Works! Keto Coffee™ and It Works! Keto Energy contains caffeine, we recommend that you do not take these two KetoWorks™ products at the exact same time. Need that boost for your brain and energy for your body in the midst of your hectic day? Find your focus wherever you go with It Works! Keto Energy. Drop a to-go packet into your pocket, purse, or gym bag for instant energy and focus when you need it most—no water needed!† As both It Works! Keto Coffee™ and It Works! Keto Energy contains caffeine, we recommend that you do not take these two KetoWorks™ products at the exact same time. Other ingredients: Grass-fed butter powder, hydrolyzed collagen peptide, natural caramel flavor, Himalayan pink salt, silicon dioxide, rebaudioside-A.